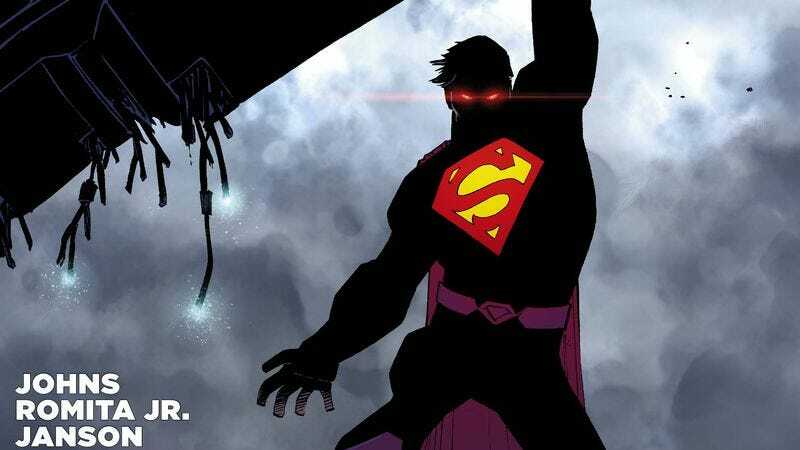 The first issue of Geoff Johns and John Romita, Jr.’s Superman run was a captivating return to form for the DC writer, elevated by energetic art from a Marvel legend. Last month’s Superman #32 introduced a new friend for the titular hero, a human with a similar backstory involving being sent to an alien location by two desperate, doomed parents. This preview of next week’s #33 shows how the Daily Planet reacts to that news, which has been shamefully scooped by another publication. Johns has a strong handle on the newsroom environment, and Romita’s experience drawing the Daily Bugle in Amazing Spider-Man makes him a great fit for this side of Clark Kent’s world—a side that has gone woefully underexplored in the New 52. The preview suggests that Clark will be making his way back to the Planet after working as a news blogger, and it’s a development that can’t come soon enough. Talking heads are fine, but the main attraction for this run is the costumed action. Fortunately, the issue’s iconic cover by Romita, inker Klaus Janson, and colorist Laura Martin (whose name is finally on the cover!) promises gorgeous fisticuffs once all the chit-chat is done.